Everyone it seems is talking about our Governor! We know he’s amazing of course, but now the rest of the nation is starting to take notice of Bobby Jindal! Rumors are already abounding of a possible Presidential run for Bobby in 2012, and I could not be more excited about the possibility! He has done soo much for Louisiana in such a short time: he passed extensive ethics reforms, completely revamped our hurricane procedures, and much, much more! But could he be ready to take his influence to the national stage? Some pundits think so, and cite his upcoming visit to New Hampshire, an early primary state, as a possible indicator of his run. With conservatives across the nation looking for a new leader to emerge, it is my humble opinion that Governor Jindal is just the man for the job. His youthfulness rivals Obama, he is a captivating speaker, and most importantly he is a Reagan conservative! Bobby is the perfect person to revamp the Republican party, and help us come back strong in 2012. Like I said in my last post, the fight is just starting, and with a man like Jindal at the helm our nation has a fighting chance of coming back from what is sure to be a disastrous 4 years. 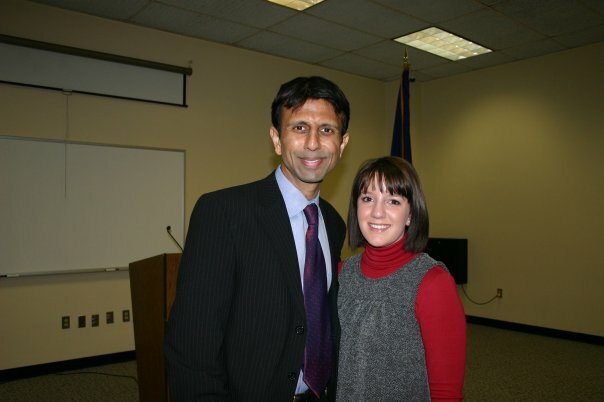 Jindal is a true fighter and a true conservative- I wholeheartedly support the idea of him running in 4 years. Its never too early to think of the future, and the time is now to take steps to protect that future for my generation, and generations to come.